While more and more Americans struggle to make do with less due to economic hardship, others are making a conscious choice to shed their possessions. When Courtney Carver was diagnosed with multiple sclerosis in 2006, she took a long, hard look at her life and decided to focus on only the things that were really important. And that meant reducing the amount of "stuff" cluttering her space and her time. "At first it seemed completely overwhelming and not manageable," she recalls. "Even the thought of decluttering my closet felt like this huge accomplishment, and paying off tens of thousands of dollars of debt felt impossible." But Carver persevered and discovered that casting off her possessions also reduced her stress levels and she began to feel better. "I'm not saying crazy lifestyles cause illness, but they certainly exacerbate issues," she says. "Freeing up a lot of resources allows me to give more of my time and attention and money to things that I care about." She began blogging about her experience and eventually left her advertising job in Salt Lake City, Utah, to launch a website BeMoreWithLess.com. Her Project 333 - how to pare down a wardrobe to just 33 items - has attracted a large online following and she has just launched a similar initiative to reduce food in the kitchen. The point is to free up time and mental energy that would otherwise be spent on the everyday preoccupation of eating and fashion. Of course minimalism itself is nothing new. Some of the ancient Greek philosophers were advocates, most religions extol the virtues of austerity and figures as diverse as the Russian novelist Leo Tolstoy and the Indian civil rights leader Mahatma Gandhi have preached the benefits of a simple life. But a recent survey by the National Association of Professional Organizers reveals that 54% of Americans feel overwhelmed by clutter and 78% have no idea what to do with it. Many find support online, adding momentum to a movement that experts say is growing. The world is getting wealthier - but with rising inequality, the BBC is investigating the winners and losers of this richer world in 2015. Listen to The Stuff Paradox on BBC World Service. "Now there's the support network online with different people writing about their experiences and offering advice through email, blog comments or social channels," says Carver. "It's still not easier for somebody to start, but it is easier to get the support once they've moved forward." Bev Hitchins is the founder of Align, a professional decluttering service based in Alexandria, Virginia. She has never met some of her clients and often provides counselling online. "I work with people who are poised to make a change," she says. "They realise they're stuck and have to do something about it. One of the easiest ways to get unstuck is to declutter." 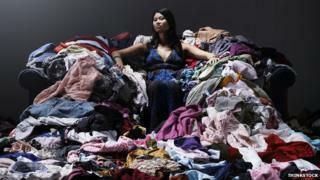 That's because most people accumulate possessions for psychological reasons, she says. "People gather stuff to protect themselves. It's an illusion though. It doesn't make them happy - it's a cover-up. We get so busy maintaining stuff, keeping it, making sure there's a place for it. It's not greed. It's trying to fill up a hole that's so big it will never be filled. "But there's a tremendous transformation that goes on if they stay with the process. You can go into therapy or you can start decluttering." The US economy is driven by consumer spending but the consequences have created could be called the Stuff Paradox. The widening wealth gap means more people have more stuff they don't want while many others are in desperate need and have nothing at all. Media captionIs America's fixation on stuff driving the gap between rich and poor? A Wider Circle is a charity in Silver Spring, Maryland, that tries to bridge that gap. "There's enough stuff in this region that nobody should be living without. Everybody should have a bed and a dresser, tables and chairs, sheets, towels and blankets," says Mark Bergel who launched the organization in 2001. Donations and volunteers help furnish the homes of more than 4,000 families a year. Crucially, A Wider Circle also offers support for education, jobs training and life coaching in an effort to tackle some of the causes of poverty. "I don't think people are to blame for having too much stuff. But I would say, have a bigger view of what you can do in your life. We have to think really big - and really simply. That doesn't mean people can't have some fun or some luxuries, but I'm not comfortable having really great stuff unless other people have enough stuff to have the opportunity to live well." Bergel doesn't sleep in a bed because he says it keeps him connected with the simplicity he wants in his own life - and with the reality of poverty itself. Every day the charity's warehouse fills with furniture and household goods from people donating their excess stuff. And every evening the warehouse is empty, each item taken by somebody in need. "Stuff is much more than stuff," says Bergel. "Stuff touches on our emotional and spiritual state. And that's what I see happening here. When we transfer items from one family to another, we change everything about that family that gets it, and we also change everything about the family that gives it."